Flywheels and flexplates have similarities, but are not the same. Often referred to as being the same part, flywheels and flexplates help accomplish the same task, but in different ways. This depends on whether it’s an automatic or manual transmission. Flywheel: Flywheels are used to mount clutches on manual transmission vehicles. 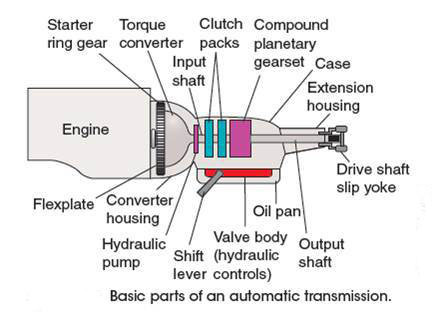 A manual transmission has a flywheel that is attached to the crankshaft and has a clutch disk in between the pressure plate and flywheel. The flywheel is connected directly to the clutch, allowing torque to transfer between the transmission and the engine. The flywheel can provide a friction surface for the clutch to contact. Through its inertia, it reduces vibration by smoothing out the power stroke as each cylinder fires. It is the mounting surface used to bolt the engine up to its load. On some diesels, the flywheel has gear teeth around its perimeter that allow the starting motors to engage and crank the diesel." A flywheel is a heavy wheel that takes a lot of force to spin around. When it's spinning at high speed, it can store a great deal of kinetic energy. Its job is to store rotational energy that produces power to the transmission. It has a good bit of mass to store energy to keep the engine turning between pulses at idle. It varies in size. It could be a large-diameter wheel with spokes and a very heavy metal rim, or it could be a smaller-diameter cylinder made of a carbon-fiber composite sometimes with steel rims. Their lifecycle can outlast that of the clutch, but will need resurfacing before installing a new clutch. Flexplate: Flexplates are used to mount torque converters on automatic transmission vehicles. Torque converters replace the clutch of a manual transmission. A flexplate is mounted to the crankshaft and connects the output from the engine to the input of a torque converter. The torque converter is located between the flexplate and the transmission. A flexplate is typically a stamped steel disc with a ring gear welded on that mounts the torque converter to the rear of the engine’s crankshaft. Flexplates are generally much thinner and lighter than a flywheel because of the elimination of the clutch surface. The metal frame of the flexplate has multiple uniform machine-cut holes for mounting to the crankshaft. The other holes are specific to the vehicle, torque converter set-up, and potential weight balance of the flexplate. If your vehicle has a manual transmission, you want a flywheel. If your vehicle has an automatic transmission, you want a flexplate. Of course, there are exceptions. Can you name one? A burning smell: Caused when too much heat is produced by the clutch facings. The odor, which smells similar to burnt toast, is caused by "riding" the clutch while driving, which causes the flywheel to wear out prematurely. Gear slippage: Will be very noticeable while driving. It is caused when the transmission is unable to shift to the next gear, so it often slips into the previous gear. When caused by a bad flywheel, gear slippage causes plate grinding, and the driver or a mechanic may find small metal shavings in the transmission fluid. Clutch vibrations: Can be felt in the passenger compartment of the car while driving. 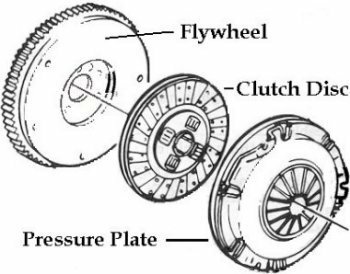 They are typically caused by the spring mount mechanism on the flywheel failing, and will greatly reduce the flywheel's performance when the driver depresses the clutch. HHP offers flywheels for Caterpillar, Cummins, Detroit Diesel and Navistar International.